We’re on the last three months of the year and just several weeks away from Christmas. I know everyone’s looking forward to the holiday festivities. Although, there are some who do dread the crowd of Christmas shoppers during December. However, we Filipinos always do make it a point to get almost everyone we know a gift that we brave crowded malls and bazaars just to go shopping. Well, you don’t have to suffer through an agonizing shopping experience. Do your Christmas shopping early to avoid the holiday crowd and to best enjoy the season. 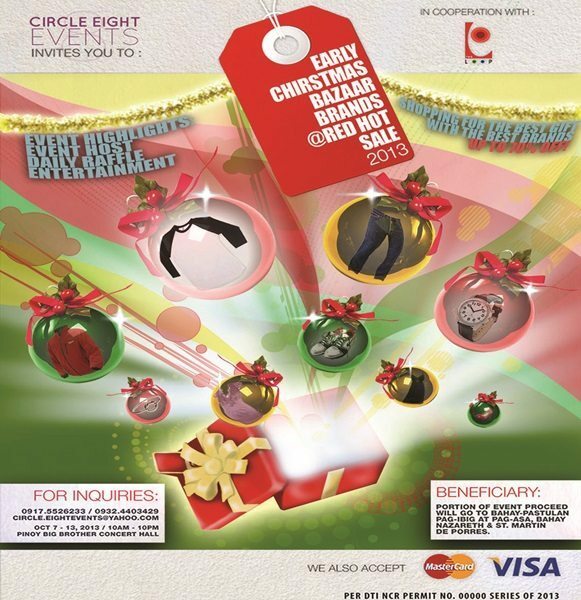 A good way to start ticking off items on your list is to head off to the Early Christmas Bazaar Brands Red Hot Sale 2013 organized by Circle 8 Events (CEE). From October 7 to 12, the Pinoy Big Brother Concert Hall will house the Red Hot Sale 2013. Doors open at 10am and close at 10pm. That’s plenty of time for you to browse through the wide range of merchandise on sale for up to 70% off. That’s huge savings on your Christmas budget! Aside from the big discounts, you also get a chance to win exciting prizes in the daily raffle. Since Christmas is all about giving, part of the income generated from the sale will be donated to Bahay-Pastulan, Pag-ibig at Pag-asa, Bahay Nazareth, and St. Martin de Porres. These charitable institutions house the elderly and street children who are in need of love and support. This means that for every gift you buy for a loved one, you also share blessings to others. Whether you are looking for gifts for your family, friends, colleague, or inaanaks, you’re bound to find unique gifts at the Red Hot Sale. Make October 7 a red letter day. Mark it now on your calendars so you don’t miss out on one of the best sales in the metro.